Richard is one of the most highly regarded real estate professionals in the Richmond area, lauded by both clients and competition for his knowledge of the industry and business acumen, as well as his easygoing and compassionate nature. He is a consistent Top Producer in the Richmond Association of Realtors which has recognized him as a “Distinguished Achiever” for more than 30 consecutive years. In 2011 he received the “Adrian Bendheim, Jr. Salesman of the Year” award, the Association’s top honor for all sales associates. Year after year, the association has recognized Richard as one of the “Top 10” Richmond Realtors. In 2014 and again in 2016, he was ranked #1 in total sales volume for Individual Agents by the 5,000+ member Richmond Association of Realtors. Richard has been fortunate to be associated with fine signature properties for which he and Joyner Fine Properties are well known. He enjoys helping all buyers and sellers, whether it’s helping buyers find their first home, empty nesters downsize, or helping a client buy or sell a “signature” estate. Richard keeps abreast of current market conditions while employing cutting edge technology affecting the industry. He got on the “high-tech bandwagon” early on, and maximizes its benefits. He has a strong Web presence, with constantly updated listings that include the latest marketing techniques: virtual tours, videos, and high-quality photography of properties. He is technology-savvy and employs social media to keep up with his clients across all platforms. Although he has years of practical day to day experience in all aspects of real estate, Richard has taken it up in a notch. 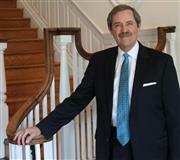 He is a co-owner and Principal with Joyner Fine Properties. While formal instruction and business management has increased his cache, Richard loves making connections and helping his clients find solutions to their needs. Richard isn’t given to self promotion and so likely won’t tell you this, but his clients will: they feel fortunate to have worked with a professional who is an experienced and committed top producer and at the same time pleasant, patient, easy to work with and completely tuned in to his clients’ needs.